The morning circle and skills practice are perfect opportunities to practice this standard. Note, as always, that all 4 processes are worked with at once. During morning circle, which is a lively way to start the day in the Waldorf classroom or homeschool environment, much math practice happens, joyfully and with movement! Because the block lesson system focuses on one subject at a time as a 1 1/2 to 2 hour main lesson for 3-4 weeks, it would not do to “forget” math during the other blocks. So the skills practice time (after recess and before lunch) of 20 minutes to 1/2 hour in Grade 2, affords an opportunity to keep up math skills between math blocks. This can be a balanced mix of written work and mental math with movement. Here is a sample morning circle from the Math By Hand Grade 2 Daily Lesson Plans book. 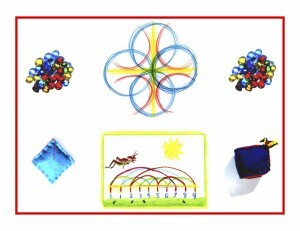 (There are four 15-day blocks in Grade 2, with two morning circles supplied for each block.) Note that Math By Hand is a fully language arts integrated curriculum, with many stories, classic poems, limericks, and tongue twisters provided. Knowledge ensues in an environment dedicated to imaginative, creative knowing, where student and teacher alike surrender to the ensuing of knowledge as a worthy goal. Tune in tomorrow for more Common Core, along with its ambient, Waldorf/Math By Hand counterpart. 1) Choose 1-2 classic poems from the Binder, pages 85-92 and teach/learn them by heart. 2) Recite and/or sing (find the tunes online if you need to) 1-2 rhymes/songs from the Binder, pages 96-106. 3) Practice 4 Processes equations using the Color Cubes to accentuate the answers: tossing them back and forth, passing them around the circle, or switching hands, front and back. 4) Review 3’s up to 36, by saying them while walking in a circle. 6) Choose a number of Tongue Twisters and say them till smooth, the more the merrier!